Gary Wood is the founder of WinSwim Swimming Software. Wood is a former test manager with Microsoft Corporation and development manager with Alltel Information Services, Inc. He has over 25 years experience in software management and design having developed some of the core mission critical banking applications used in financial institutions worldwide. Following is Wood's introduction to WinSwim Swimming Software and the new Colorado Time Systems timing console interface. I am looking forward to 2006, the Chinese "Year of the Dog". I feel it will be a great year! Let me introduce WinSwim Swimming Software and give you some thoughts about software and how it can make teams more competitive. All endeavors have a beginning and I started WinSwim to meet the needs of parent volunteers helping summer swim leagues. These parents would literally spend hours preparing for meets and producing award labels. Being a parent of children that swim, a software engineer and one of these parent volunteer provided the catalyst needed for me to create WinSwim. Over the years, I feel the need for swimming software to be innovative, easy to use while being inexpensive has become paramount. At the last ASCA 2005 conference in Ft. Lauderdale I talked to many of the coaches and found this need has become greater than it has ever has been. Being able to create a product that is capable of fulfilling these goals motivates me to do my best. Where a number of software solutions come in separate packages, WinSwim contains the team manager, meet manager, timing console interface, Multilanguage and reports using Crystal Reports™. All of these features are contained in a single integrated software package. I could list you a long list of features, but it would be easier for you to see them by going to WinSwim website or downloading a trial from the download page. One of the latest features is the interface to the Colorado Time Systems timing consoles. 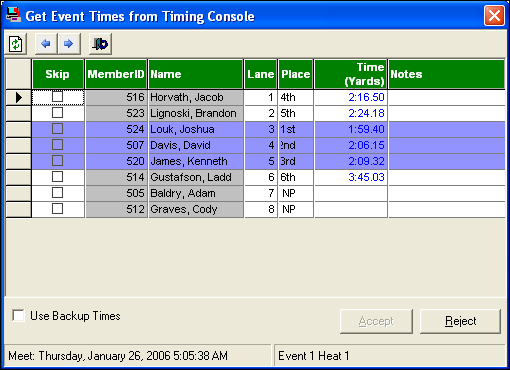 This interface allows event sequences, event labels describing the events and time results to be easily updated between the timing console and the WinSwim meet management software. The timing console and the meet management software both contain descriptions of the meet events. WinSwim easily allows you to check, edit and synchronize the event labels that describe the events between WinSwim and the timing console. So, both the timing console and the meet management software are using the same descriptions. All event sequences in the timing console can be replaced with the events on WinSwim. Or, you can downloaded the events directly to WinSwim from the timing console. A nice touch is that the order of the event labels can be changed to describe the event in any number of ways. 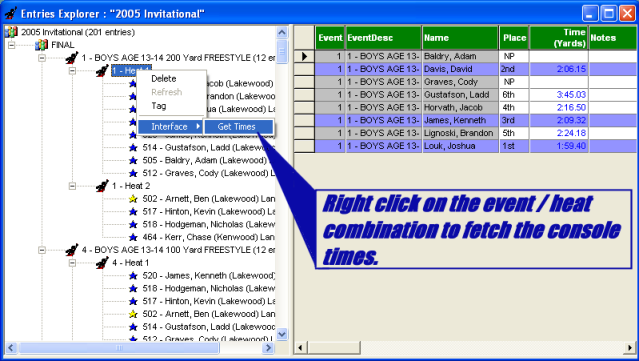 As an example, "Boys", "Age 13-14", "200 Yard" and "FREESTYLE" event labels describing the first event can be arranged, included or excluded in any order. As the meet is occurring, WinSwim will allow you to manual enter the time and placing from within the WinSwim entries explorer (see image below). Or, if you have the Colorado Time System 5 or 6, just right click with the mouse on the event/heat to access the results on the timing console. You are able to retrieve the console final or backup times and review them before committing them to the meet results. As you can see, the ease in updating event sequences and downloading results from the timing console is second to none.